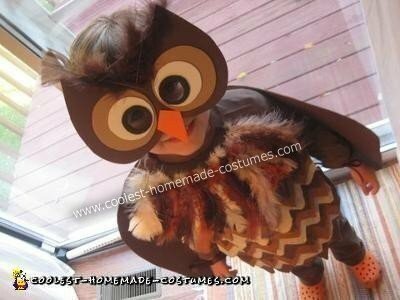 My five year old wanted to be an owl but I can’t sew. I managed to get this ensemble together with about $20 worth of felt, foam board, ribbon, craft feathers, and a cheap pair of plastic novelty glasses (with the plastic lenses popped out). 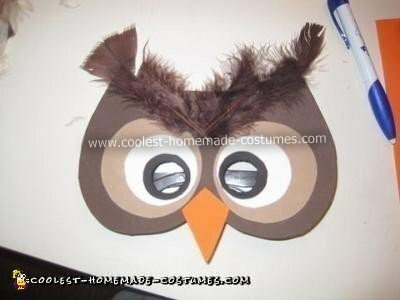 Other items used to construct the owl costume: x-acto knife, scissors, glue stick, tape, safety pins. The base of the costume consists of stuff we already had: orange Crocs, brown socks, brown fleece pants, long sleeved brown t-shirt, and a short-sleeved brown t-shirt. 1. 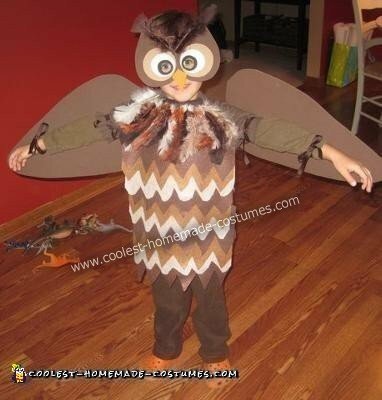 I layered three different colors (dark brown, light brown, oatmeal) of felt, cut them into a zig-zag shape and attached them to the short-sleeved t-shirt with safety pins. 2. I attached some craft feathers to some felt, using a glue stick, and pinned it to the top of the t-shirt. 3. Mask: brown, beige, white, and black craft foam sheets cut to a pattern that I drew. Used the x-acto knife to cut holes in the foam. Used tape to attach the mask to the plastic glasses frame. Taped two feathers to the top of the mask. Glued the orange beak (craft foam) onto the front of the mask. 4. 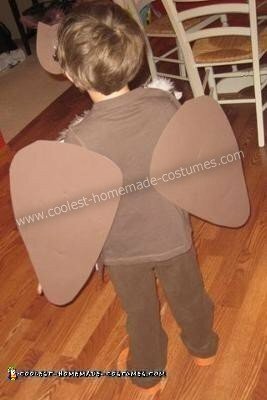 Wings: cut out of dark brown foam sheets. Two brown ribbons are attached to the underside of the wings with safety pins.